Spotting scope users demand top quality optics that perform flawlessly under all weather conditions. ALPEN Spotting Scopes are nitrogen filled, waterproof, dustproof, and shock-resistant. 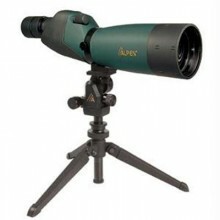 This ALPEN 20-60x80mm spotting scope is waterproof and comes with a 45° angled eyepiece, tripod and nylon carrying case. All ALPEN Spotting Scopes feature powerful lenses, and come standard with a durable, padded field carrying case (except #788-786-742-745 kits). Most models come with a portable 12" swivel-head tripod. (Model # #788-786-742-745 kits come with upgraded # 705 micro adjustable tripod). Click the button below to add the Alpen 20-60x80 Spotting Scope (Straight) to your wish list.